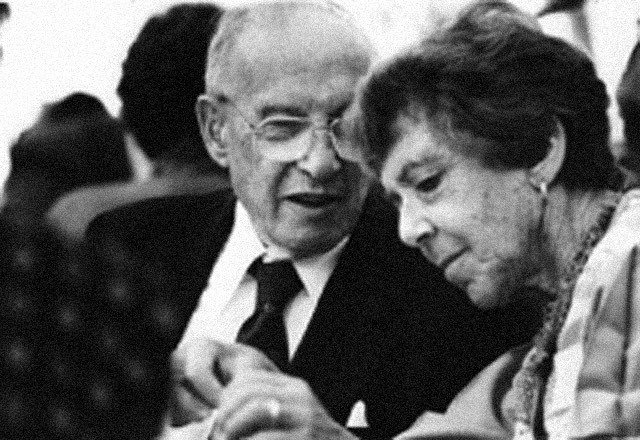 While working with Peter F. Drucker in the last years of his life, I had the opportunity to observe a model partnership – one of respect, play, and dialogue. While he’d worked successfully with the CEOs of GE, Proctor and Gamble, and many others from the largest companies in the world to leading heads of countries, his true partner was his wife, Doris. Doris shot back, “Can you imagine trying to explain to him a cell phone?” Peter then came back with, “That would not have been a problem, because there was not any kind of phone in Socrates’ lifetime. It is easier to explain something new than to convince someone that the staircase is not the best alternative.” Doris’s expression was puzzlement. But she said nothing. I was with Peter on April 2, 2004. When I arrived, he told me that the night before Doris had sown the hems of his pajama pants closed. He said she did that every April Fools Day. He still laughed at it. The following spring, as I was driving Peter home from his office one day, he insisted that we stop at a store so he could buy Doris the largest card he could find for Mother’s Day. Doris later told me that their four children were born in the years Peter wrote his first four books. After the fourth, she told Peter no more kids, but that she would continue to proof and read his books. He wrote 36 more. After Peter passed away, Doris shared many more stories. One was that she was certain he had taken up ice-skating at the age of 40 because Camille Berra, Yogi’s wife, had invited him skating with her. Camille is a fantastic ice skater and Yogi would not skate with her, yet he did play tennis with Doris until she and Peter moved to the West Coast. Such was life with the Drucker duet. During my last meeting with Doris, four months ago, over tea, she encouraged me to update my book on Peter, saying the stories needed to be more current. With a twinkle in her eye, Doris was challenging me. She would hold a party for the book when it was done, she said – but I’d better hurry. This entry was posted in History Today, Individual and tagged doris drucker, partnership, peter f. drucker by Elizabeth Edersheim. Bookmark the permalink.